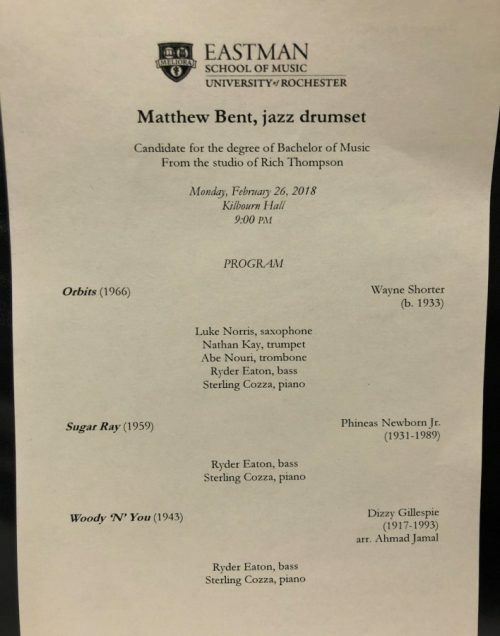 The following post was written by senior jazz major Matt Bent. Thanks Matt! Fast forward three and a half years—through all of the unforgettable memories and friendships made, rehearsals, private lessons, gigs, concerts, theory exams, and countless hours of practicing. The time has come time for me to give my own Senior Degree Recital. My name is Matt Bent, and I’m from Red Bank, New Jersey. I play the drums and am a senior in the Jazz & Contemporary Media (JCM) department. In addition to my JCM degree, I am also pursuing a concentration in German, and I am a recipient of Eastman’s Arts Leadership Certificate Program. In the fall semester of my senior year, I spent much of my free time practicing drums and piano and not really thinking too much about my recital. I knew that I wanted to have my recital in the spring semester so that I’d have more time to practice, but I also didn’t want to push it off until the very last minute. 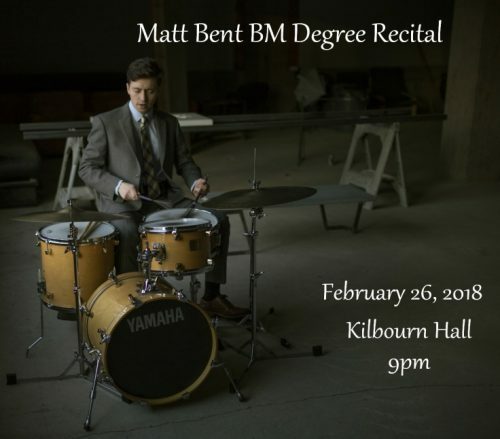 I chose to have my recital on Monday, February 26th at 9pm in Kilbourn Hall. 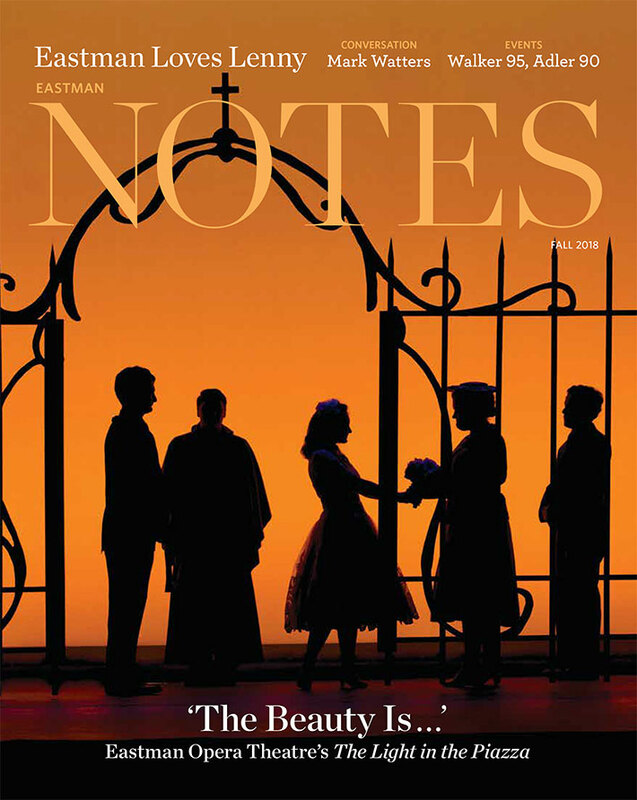 This seemed to be the perfect time for me, and it allowed me to perform in my favorite hall at Eastman. Though my fall semester carried my lightest course load yet, it somehow still came as a shock when I walked into my private lesson in late-November, and my teacher, Rich Thompson, told me that my senior recital was only two and a half months away! What pieces do I want to play? At Eastman, many of my friends and I spend anywhere from 1-3 hours a day only listening to music. Narrowing down all of my favorite music to only six or seven contrasting pieces was definitely a challenge. In choosing my repertoire, I wanted to experiment with various styles/eras of music, and instrumentations (which ranged from piano trio to sextet). Figuring out the order of my recital was nearly as tough as choosing the music! The repertoire and its order play equally important parts in creating a desired mood. I found that a lot of my music seemed to have more fire than it did light, and so the challenge came in creating a program that comfortably balanced tension and release. In the three and a half years I’ve been at Eastman, I’ve been lucky to make music with tons of great musicians and people. In choosing personnel, I wanted to feature many of my friends on the pieces that suited their playing the best. Once I had established a program I liked, it was time to start practicing and rehearsing. A bulk of my practice time was spent transcribing and listening to recordings of the pieces I chose. I transcribed at least bits and pieces of each recording, so that I could get a better grasp of the style and understand how my instrument fits into the whole song. I also spent much time playing along to these recordings, trying to understand the specific rhythms and dynamic variation used. This also gives me a chance to experiment different textures, colors, and ideas of my own. When February came around, I began scheduling rehearsals. I decided to have four rehearsals—one with only my rhythm section players, and the other three with all musicians. My private teacher, Rich Thompson, also came to the fourth rehearsal and offered some final pieces of advice. To my surprise, the scheduling process proved to be pretty long and arduous as I had to accommodate the schedules of eight very busy musicians. Then I had to prepare lead sheets and transposed parts for everyone in the band. I was able to find some of these online, but I had to transcribe a few myself. Once everything was in place, it was fun to run through some of my favorite music with my friends. I woke up at 8AM on the morning of February 26th and was feeling prepared and excited about my recital, but I must admit that I also felt somewhat anxious. I went to my Advanced German Romanticism Class at 9:30AM and had trouble focusing as various thoughts raced through my head. Before I knew it class was over and aside from one Jazz Performance Workshop (JPW) rehearsal with jazz piano professor, Gary Versace, I was free all day to take care of a few last-minute details. First, I wanted to set up a livestream option for my friends and family who wouldn’t be able to make it to the concert. The staff at Eastman’s Technology and Media Production Office took care of this and provided me a livestream link to share. Then I tuned my drums and practiced for two hours—running through my regular practice routine and playing along to some recordings. Once I felt ready, I packed my drums up, put them on my cart, and rolled them down to Kilbourn Hall for a sound check. Oddly enough, I didn’t even run through any of my songs at the sound check. My friend, Ben Bird, had his senior degree recital on jazz trumpet two hours before mine at 7pm, and I was playing on his whole recital! We ran through a few of his songs, and I felt like that gave me an adequate understanding of the hall’s acoustics. After sound check I met up with my mom, dad, and brother, who were all in town for the concert, and we went out to dinner. I was happy to catch up with my family before playing, but it wasn’t long before I had to run back to Kilbourn Hall for Ben’s recital. I think that playing a recital two hours before my own actually ended up working to my advantage. By the time, Ben’s recital was over, I felt really relaxed and stress-free, and I just wanted to make some more music! When I stepped out on stage for my own recital, I was so overwhelmed by the turnout and support. I sat down at my drums, closed my eyes, and began to play….and before I knew it, the whole concert was over in a flash. I had a lot of fun and thanked some of the teachers, friends, and family members who taught me so much in my time at Eastman. Afterwards I joined the audience for my reception, where I was congratulated and greeted with many hugs. It was then that reality hit me, and I began to feel like I had really accomplished something. I felt proud to be an Eastman student and excited to see what the rest of my life as a musician will bring.